Cooler Master, a global leader in designing and manufacturing innovative gaming peripherals and computer components, today announces the debut of ControlPad, the world's first PC keypad with analog Aimpad technology, designed for gamers, content creators, musicians, and more. "Designed as a passion project from the ground up, ControlPad aims to change the way we interact with our most used programs and applications on a more intuitive scale," says Bryant Nguyen, Peripheral General Manager. ControlPad harbors 24 mechanical keys available in Cherry MX Red or Gateron Red switch types. It is fully programmable through easy to use software, has a removable wrist rest for ultimate comfort, two precision scroll wheels, fully RGB backlit, and finished in a sleek brushed aluminum. ControlPad is equipped with Aimpad technology that provides mechanical keyboards the precision control most commonly found in devices such as aviation joysticks, steering wheels, and gaming controllers, enabling analog control in digital inputs. Enabling analog control in digital inputs, Aimpad allows users to control speed, yaw, adjust pitch, creep, and roll. During driving games Aimpad can be utilized to make smooth turns on the fly or ease into gentle curves by simply changing the distance of the keypress. That's an ergonomic nightmare. Why would you put the scroll wheels so far over the edge of the keypad? "Cooler Master, a global leader in designing and manufacturing innovative gaming peripherals and computer components "
"Our community has been the most valuable part of our company, giving us insightful feedback to help us improve our products for wider appeal and functionality"
"This is why we want your help"
Am I really the only one bugged by this ?? At least 28 people disagree with you, as they've already backed it. At $100, this thing is not only a rip-off, but a con. You can get a full-size mechanical keyboard for that. Maybe not from "A list" brands, but even so. I dont think the point of this is to REPLACE your keyboard, but accompany it. I can think of plenty of games (like magicka with its insane combos and multiple strategy games where you have large numbers of groups to switch between) where a programmable keypad would be a huge timesaver. I just needed a set of buttons to either assign a combo to or assign a group of units to for quick switching. Granted, the price is insane, this should be like 20-25$ at most, but it does serve a niche that at the moment nobody else does as far as I know of. Yeah, the idea is definitely to supplement, not replace. Or serve as a "gaming pad" for those who don't want a full mechanical keyboard for non-gaming use. I've been interested in something like this for a while, but this doesn't look like what I want - I've been thinking more along the lines of a mechanical Logitech G13, including the analog stick. Now, can anybody make sense of what that "aimpad allows for analog input through digital devices" mumbo-jumbo means? Does this have analog switches for some keys? Or some sort of software silliness? If it had analog keys for WASD or similar, that would make it interesting. For those of you complaining about the price, devices like this have always been expensive. 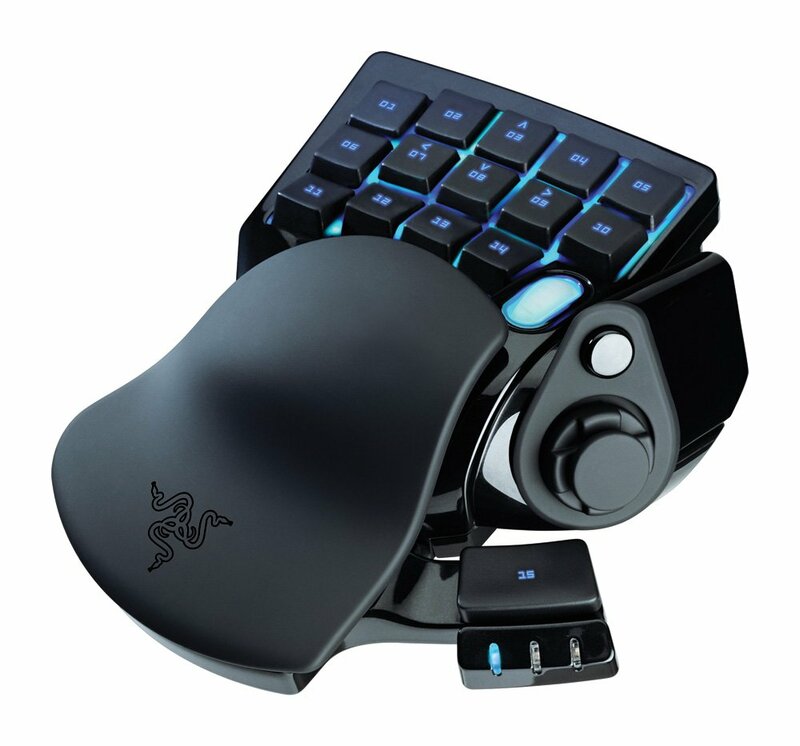 The G13 was like $70 and non-mechanical, and Razer has the Tartarus with fewer keys and a worse layout for a similar price. Are they expecting this to compete with the Orbweaver and other such products? CM's iteration is ugly and looks uncomfortable af..
Too bad Logitech gave up their G13 - still have mine and love it, options are limited, so CM sees an option to branch out, and why risk your money when you can do crowdfunding? Why should crowdfunding only be for startups? If there's one thing we know, it's that large companies tend to stagnate as pressure to deliver predictable profits gain priority among investors and shareholders, forcing design conservatism down the pipeline. If crowdfunding can be a way to get innovative and unusual products approved, I'm all for it, particularly with the guarantees of delivery and quality manufacturing associated with larger companies. It's not like they're taking money away from startups; this isn't a zero-sum game. As for the product in question here, I think the main problem is that CM released a crappy, uninformative press release that omits a lot of important info. After checking out the kickstarter, I'm actually considering backing this, specifically the $55(!) version with Gateron switches. Why? First off, every key can register analog input. This partially negates the desire for an analog stick (even if I like the thought of reducing in-game movement from 3 fingers/4 keys to 1-finger input). Then there's the price, which for the Gateron switch version is excellent. It's not bad for the Cherry version either, even if retail prices are likely to compete with or exceed the $130 Razer Orbweaver Chroma. Even the cheapest kits come with two keycap sets (generic + one of 4 specialized designs for FPS gaming, PS, Illustrator or Premiere), and while the scroll wheels are placed in an utterly dumb position (impossible to reach without moving your hand - why not place at least one on the side edge of the board? ), I don't think they'll be the most important for me, and it's better to have them than not. I can imagine this being plenty useful in Lightroom too, which is a plus for me. Oh, and it has a full 5-row layout, which dramatically lowers the need for key remapping and teaching yourself how input works in every single game. I particularly like the "mini-spacebar" in the bottom right. In short: this really isn't as bad as it looks. You're not alone. These big companies are bigger scumbags than ever.They beg for free money for their own monetary gains. Gotta increase profits somehow. I'd rather pay for a (well-executed and innovative) beta product with proven manufacturing backing it than either gamble on a pie-in-the-sky project from an unproven company or pay store prices for run-of-the-mill products lacking the features I want. While I entirely agree that major companies are generally scumbags and looking to rip people off, this doesn't strike me as a case of that. I might, of course, be wrong in this, though. Kickstarter is supposed to be for small startups or people like you and me or so I thought. Coolermaster has more than enough money for their own R&D. Mostly, sure, but if they have a cool/useful/innovative product that they can't get approved by whatever board or committee is responsible for making that decision as its "too niche" or "not safe enough", would you rather never see it launch, or have them test it out through less traditional channels like KS? Personally, I'd want the latter. I'm far more wary of startups promising pie-in-the-sky concepts than this, as that's where backers are likely to lose/waste their money. I'd rather never see the product. If a huge company can't afford to make something on their own it's probably not a great product/idea. I think a lot of you guys are missing the point. This isn't a normal macro pad. All of the keys are analog like the Wooting One while still being fully mechanical. If it were a normal macro pad, I would question why they were putting it out too. Turning to KS is a separate issue worthy of a separate set of opinions, but at least understand what makes this product unique in the marketplace. Logitech and Razer don't have anything like that. No one but Wooting does.